By 1700 the Dutch army had a rich history and was the second largest army in Europe. We'll first take a look at its composition or order of battle. Then the state it was in shortly before the War of the Spanish Succession started. The page is finished with a short history of the Dutch army. The 'national' cavalry consisted of 73 squadrons. I hope to add an order of battle for these at a later time. Of these regiments the Blue Guards numbered three battalions and the Frisian Guards and most Swiss two. So this makes for 66 regiments and two independent companies which fielded 75 national battalions and two companies. To the national troops were added the subsidy troops hired from other countries1. From Denmark: 8,000 infantry, 3,000 cavalry and 1,000 Dragoons paid jointly with England. From Prussia: 5 infantry regiments amounting to 4,225 and 2 cavalry regiments to 874 also paid jointly. From the Pfalz: 4 cavalry and 4 infantry regiments amounting to 3,024 infantry and 1,128 horse. From Hannover: 3 battalions each of Hannover and Celle totalling 4,452 infantry. As regards cavalry there were also 3 cavalry and 1 dragoon regiment of each about 500 men. From Mecklenburg: the Schwerin regiment. In Anglo-Dutch service: About 9,000 men of whom 1 infantry regiment, 1 cavalry regiment and 2 dragoon regiments were paid directly by the Dutch. From Brandenburg Ansbach: 2 Infantry and 1 Dragoon regiment. Finally Munster brought 1 cavalry and 2 infantry battalions. The units of the Dutch army were not paid directly by the central authorities. Payment was a responsibility of the constituent provinces of the union, this was called the repartition. It's interesting to look at this because it says something about the relative strength of its members. Note however, that this is the 1700 strength and does not include the large augmentations in 1701 and later on2. Note that Holland paid more than two-thirds of all cavalry units, and slightly less than half the infantry units. It might be possible that there was a special reason to arrange things this way. Perhaps Holland had more horses, or could more easily feed them. It could also have to do with garrisons, or its greater inability to provide regular payment. The table also illustrates why there were 7 united provinces, even though Drenthe was also firmly protestant. Drenthe was so poor that it paid only one battalion. One can imagine that such a small contribution did not warrant representation in the essentialy military alliance that the United Provinces were. In 1701 and 1702 the Dutch army was brought back to strength and the papers relating to this give a good idea about how strong the abovementioned units were: The 1700 Staat van Oorlog called for 94 cavalry companies which regularly had 43 horses. The first Extra-Staat van Oorlog following it added 12 men to each company, the second added 4 men more and added 72 new companies of 58 horses. The third added 48 companies of subsidy troops. This resulted in a cavalry strength of 214 companies with 13,489 horses. The Dutch army originated from the Dutch revolt (1568-1648). At first it probably did not differ much from the other mercenary armies of the time, but this was changed in the years shortly before 1590. At that time the military genius of Stadholders Maurits of Orange and Willem Lodewijk of Nassau revolutionized its training, transport, tactics, organization, discipline and artillery. Van Oldenbarnevelt's organizational and financial genius guaranteed the means to implement these measures and the expansion of the army. This 'new' army then showed what it was made of in the siege of Steenwijk (1591). Instead of trying to gain the city by starving it the stadholders made their soldiers dig the trenches themselves and had 50 guns which fired 29,000 bullets. The contrast with the famous seven month siege of Haarlem in 1572-15734 was remarkable and after only 44 days Steenwijk surrendered. The exercise was repeated at Geertruidenberg in 1592. The most remarkable aspect of this siege was that the population soon discovered that the disciplined behavior of the soldiers allowed them to sell their wares in the camp and that they could even take a look at the event. The offensive of 1590-1595 would lead to the conquest of Groningen and Drenthe and most of Overijssel and Gelderland. The down side was that some provinces had their troops on the territory of these new provinces and tried to dominate them with these. Van Oldenbarnevelt solved this in November 1596 when the States General decided that all the fortified places outside Holland, Zeeland, Friesland and Groningen were from then on governed by the Raad van State. In 1597 the United Provinces started a new offensive which led to the conquest of areas north of the Rhine which had remained under Spanish control. By this year the Dutch army was the most advanced army of Europe and the second in size. In 1598 France and Spain made peace and from then on Spain could concentrate its forces against the Dutch. Financial difficulties did however lead to mutinies on the Spanish side, and so the Dutch took the offensive in 1600. This offensive was made along the Flemish coast and led to the famous battle of Nieuwpoort. Here the famous Spanish infantry proved that it was still superior in fighting skills. However, the Dutch infantry proved to be superior in its methods. While the Spanish infantry advanced the Dutch proved capable of slowly retreating without loosing their cohesion. At the moment the Spanish got tired and had the sun in their eyes Maurits then let his cavalry charge and routed the famous Spanish infantry. The victory of Nieuwpoort can be described as the triumph of method over power5 and was certainly just as characteristic of the Dutch army which fought a hundred years later. To top this off I dare to state here that this credo, which should really be called: 'method above honor', is still characteristic of the Dutch army today. Traditional Dutch wisdom has never appreciated useless sacrifice and has always mistrusted stories about heroic actions. In the nineties the Srebrenica disaster gave rise to endless debates about political decisions and a lot of analyses, but there was little debate about the honor of the Dutch army or even the state. What was debated were the weapons the army had in Yugoslavia. Next the army went to Afghanistan with the Pzh2000, Apache helicopters and F16's and it used all of them. In order to really understand the contemporary and current attitude of the Dutch army one should read 'Het Staatse Leger' parts 7 and 8, which appeared in the fifties, or perhaps the 'Geschiedenis van het Koninkrijk der Nederlanden in de Tweede Wereldoorlog' by Lou de Jong. They are both a rather cold-hearted analyses of what happened. Adjectives like: heroic, brave, tough etc. etc. are conspicuously absent. A good example of this is an episode from the battle of Ekeren in which some Dutch troops were attacked by a force twice their size. In such a case English historians would till this day write about a 'heroic resistance'. Het Staatse Leger writes: 'It was only their exercise, discipline and the leadership of brave and experienced commanders which prevented this battle from ending in a terrible defeat.' It then goes on somewhat about training and stating that the French admitted that the Dutch fired more swiftly. Comments about a heroic attitude of the troops or the like are however totally absent. In the 1660's infantry regiments might number between 8 and 13 companies. These companies could then vary in size between 50 and 200 men. In 1671 Holland then started to rationalize by ordering the every regiment except the guards and the marines should number 12 companies, and that most companies should number 100 men. Other provinces took similar measures. Similar decisions were made with regard to the cavalry which had up till been organized in companies. In 1667 the States General ordered that these should contain 79 or 86 horse while each regiment should number 6 companies6. When William III came to command the Dutch army he could rely on the tradition of Maurice, but as regards numbers the army had shrunk to an irresponsibly small force. The Dutch army and militia then prevented foreign occupation by defending the inundations and started to rapidly increase in size. Meanwhile William's diplomatic talents brought more and more European states on the Dutch side. In 1674 England and the bishopric of Munster were forced to make peace and by June 1674 France only held on to Grave and Maastricht. In the years 1674-1677 the strength of the army then fluctuated between 93,456 men in 16747 and 88,588 men. It fought battles at Seneffe (1674) and Cassel (1677) but was not very successful in these. Because the war cost a lot of money, results were lacking and then neutral countries were profiting, William was forced to make peace at Nijmegen (1678). By this peace Louis gained a lot of territory but in exchange he diminished the tariffs on Dutch imports. The different factions in the States General then fought about a lot of issues, but did not disagree much about having a serious army. Most disagreements were however ended by the revocation of the edict of Nantes in 1685 and the events that followed. The most important of these was that France violated the treaty of Nijmegen by raising the tariffs on Dutch trade. Most of the opponents of William III then joined his side and agreed to raise funds to increase the Dutch forces and to hire foreign armies. Their goal was the invasion of England, which fully succeeded in 1688. At the organizational level the States General in 1673 ordered that every company should number 89 men. Only the guards, the grenadiers and some garrison units were excepted. What was most significant was that previous rationalizations had been attempted by the provinces, but this one was ordered at a national level. After the war had ended the number of men in each company was gradually reduced to 55 in January 1679. As regards the cavalry the number of men in each company was reduced to 47 in 16858. This uniformity greatly facilitated the organization and command of the army. Except for the guards and the grenadiers the command could count on it that each unit had about the same strength. After the conquest of the English throne the Dutch Army became the heart of a coalition army. The first step in this development was taken when on account of the invasion of England the States General hired complete regiments from other armies. At the same time the national army was strengthened by increasing the number of men per infantry company to 71 and per cavalry company to 69. In addition to this three new infantry regiments were raised in 1690. In order to easily command and supply the many foreign units the States General asked the foreign governments to supply units organized along the same model as its own troops. In September 1688 it hired six infantry regiments from Sweden which each comprised 12 companies of 84 men. 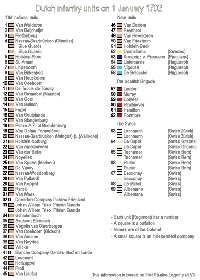 In August 1688 three cavalry regiments of 6 companies numbering 72 men each were hired from the Duke of Württemberg. Spring 1689 saw the States General hiring a Saxon cavalry regiment organized on the Dutch model9. Apart from 'importing' units based on the Dutch model the Dutch also exported units based on this model. This happened when almost 15,000 of their troops were transferred to the English establishment after the invasion. The English army was then reorganized to the Dutch model. As regards composition this meant that it also started to hire foreign troops and started to introduce battalions which were organized like Dutch battalions. As regards tactics the Dutch drill had particular ways of doing things. The most important of these was that their infantry used platoon-fire. In England this Dutch drill was then known as 'Dutch manner' or 'Dutch way' and was adopted by their army. Regiments from other states which participated in the coalition army also brought innovations home to their national armies. What we should consider here is that on a logistics and organizational level all these units were then integrated in the logistics system organized by the States General. This meant that for most units their maintenance and supplies were organized by the Dutch. In the Nine years war the coalition was successful in Ireland. In Flanders fighting started with a victory in the minor battle of Walcourt (25 August 1689), but this was followed by a lot of far less successful engagements. The battles of Fleurus on 1 July 1690 and Staffarda on 18 August 1690 were clear defeats. They were followed by the loss of Mons on 8 April 1691 and a defeat in the minor battle of Leuze on 18 September 1691. The loss of Namur followed on 30 June 1692. After these defeats the battle of Steenkerque on 3 August 1692 was another defeat. On the other hand it proved the steadiness of the outnumbered alliance infantry which probably caused just as much casualties as it suffered. It was followed by more defeats in the battle of Neerwinden (or Landen) on 29 July 1693 and the battle of Marsaglia on 4 October 1693. In 1694 the alliance took Huy in September, but this was not a big accomplishment. In 1695 the alliance army took Namur back on 4 September and it seems that this convinced the French that they could not hope to conquer the Spanish Netherlands. Peace was then made at Rijswijk in 1697. After the peace of Rijswijk in 1697 the Dutch army was demobilized. Except for the Swiss most foreign troops were dismissed. On the other hand William's troops in England came back in Dutch pay. The cavalry regiments were reduced to three companies of 47 horses (42 men) and later on 43. On the Staat van Oorlog for 1698 the number of infantry companies was reduced to 655 which regularly held 55 men. Later on the regular national infantry regiments were reduced to 51 men and the Swiss regiments to 150 men. For the first part of the history of the Dutch army I have used: 'The republic' by Jonathan I. Israel. The rest of this page is mainly based on 'Het Staatse Leger' Volumes VII and VIII and the excellent dissertation by Stapleton. 5) For the short history up to this point see Israel chapter 12.